Within Teamwork Projects you can choose to export a .xls file of the links you have added to your project or copy them to an existing project. To export, navigate to the links section of your project. From there, click the options (three dots) button to the top right, and select Export Links. You will then be presented with options on what links you would like to export. The options are based on categories you have created. Once you choose an option above and select Export Links, a .xls file will be automatically generated. To copy or move project links, again select the options button and then Move or Copy Links. 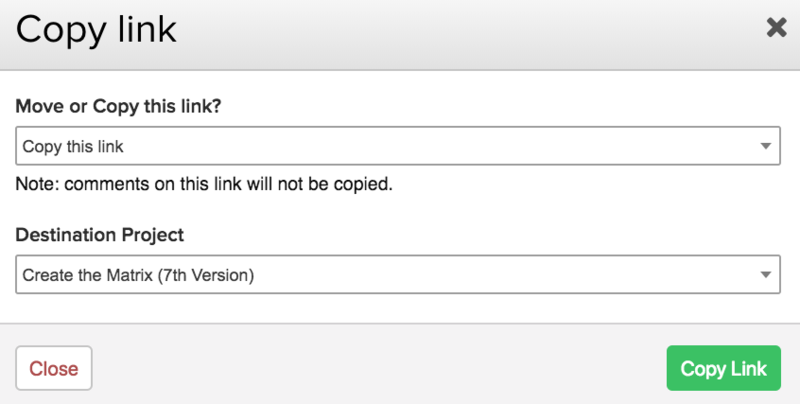 You will then be asked to select whether you wish to copy or move links and choose which project you wish to copy them to from the drop down options. Once you choose Copy Links or Move Links, you will be brought to the links section of the project you chose to copy or move to. Note: When copying a link, any associated comments will not be copied.